In some ways, this suspenseful set of episodes–4.15-4.18–in which Obi-Wan fakes his own death and goes undercover amongst a group of bounty hunters working for Dooku in order to uncover a kidnapping plot against Chancellor Palpatine, is the most Obi-Wan-centric Clone Wars arc to date, except for the fact that, for most of it, he doesn’t look or sound like himself and is pretending to be the sociopathic assassin, Rako Hardeen. Regardless of this, however, thanks to fantastic writing, directing, and acting, Obi-Wan’s character always manages to shine through beneath his new gruff, grizzled exterior. 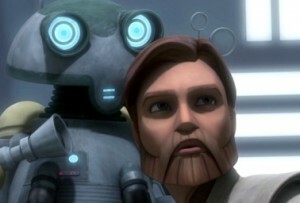 Even as Rako, we catch glimmers of Obi-Wan’s humor and wit embedded throughout the dialogue, as well as his nobility and heart, and, just as impressively, the animation includes certain subtle facial expressions and physical gesticulations that indicate that our Obi-Wan is under this mask, and then of course there is the brilliant, chameleonic voice work by James Arnold Taylor, who, as Hardeen, sounds vocally unrecognizable as the same man who performs Obi-Wan and yet the fact that he is the same actor allows him to work in the most minor of touches that link the two characters’ voices to each other. 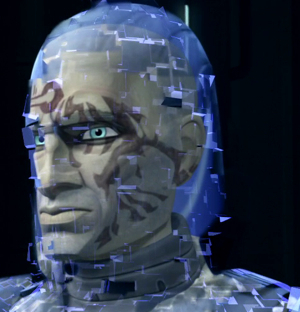 In addition to Obi-Wan’s truly stunning accomplishment in not only ultimately ingratiating himself to one of the bounty hunters, Moralo Eval–or at least temporarily, until Dooku’s interest in “Rako” seems to threaten Moralo’s position as head of the mission–and even inspiring Cad Bane to save his life at the critical juncture when Moralo turns on him (as warped as Bane is, even he has a sense of honor and believes as skilled a bounty hunter as “Rako” deserves to die fighting, not due to a rigged game) but also in repeatedly saving the lives of all of the other men running through Moralo’s deadly obstacle course, never once violating his Jedi code even whilst managing to not get caught, the other most fascinating aspect of the episode is actually Anakin and his relationship to Obi-Wan. In order to sell the fiction that Obi-Wan has actually died, Obi-Wan and the Council decide that Anakin has to be kept in the dark about the truth of the operation. They know him to be an emotional and volatile young man whose legitimate, public grief over his Master’s demise would help sell the verisimilitude of the death to everyone outside of their circle. And while they do get the initial intended response, what they’ve done also constitutes emotional manipulation and a cruel violation of trust. When Anakin learns the truth from Obi-Wan at the end that not only the Council but Obi-Wan himself had lied to him about something as important as the death of his beloved friend, he doesn’t only look furious but deeply, personally hurt, as he should. The irony is that, in lying to Anakin, they are actually trying to protect Palpatine of all people, not knowing he’s the mastermind behind not only the kidnapping but the entire Clone Wars, and that furthermore, this lie is a crucial step in the large wedge that will form between Anakin and the other Jedi. Anakin will retreat further and further from the Jedi, trusting them less and less, and giving further weight to Palpatine’s seemingly innocuous, encouraging statements, which will in turn cause the Jedi to trust him less and less, thus driving him even further into Palpatine’s arms–a vicious cycle. 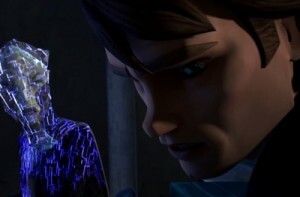 After Obi-Wan tells Anakin the truth, he angrily replies to him that he should be careful that the Council isn’t lying to him, Obi-Wan, as well, the sad irony being that Anakin is right that there is a deeper lie here, but that it isn’t the Jedi who are perpetrating it but rather his new mentor, Palpatine (there’s a great moment in which a bounty hunter disguised underneath a hologram of Palpatine attacks Anakin, thus pointing towards a truth Anakin won’t realize until the end of his life). There is also wonderfully dark irony in the fact that the final act that will seal Anakin’s descent into Darth Vader is an attempted fight to the death with Obi-Wan, the very man whose seeming death drives Anakin into despair and anguish in these episodes. It’s also worth noting that Anakin respects Obi-Wan so much at this point that, despite his rage against Hardeen, he restrains himself from killing the real Hardeen when he captures him in the first episode, because he knows that his Master would rather Hardeen be in jail than killed at Anakin’s hand. I also love the scene in which Anakin wants to rush in and help Obi-Wan, who has been out of touch with the Council for a while, and Yoda speaks to him almost the exact words he will later speak to his son, Luke, when his friends are being tortured on Cloud City: “If you leave, help him you could, but his future uncertain is.” At this point, Anakin and his son are so very much alike. And as much as Palpatine wants the Jedi to fail at preventing his kidnapping–his full plan being for the Separatists to kidnap him in exchange for the release of some top Separatists prisoners from the Republic, which will serve the dual purpose of having those players free to continue maintaining his war (he is likely worried by the recent attempts at talks between the Republic and the Separatists), as well as making him seem the victim of the evil enemies, thus further galvanizing the Republic to keep fighting–one can see the chilling, quiet smile on Palpatine’s face as he watches Anakin duel with Dooku. We can see him recognizing Anakin’s rage during the fight, just as he will gleefully react to Luke’s anger when fighting Vader in Return of the Jedi. It is only a matter of time before he replaces Dooku as his Sith apprentice. Significantly, we know that Anakin finally will kill Dooku, and that it will be upon the event of “rescuing” Palpatine from a later, successful kidnapping attempt. The wheels are in motion, and the time of Revenge of the Sith draws ever closer.